So in true Halloween fashion, I wanted to make both a black and an orange marbled loaf. I have dreams of turning this into the most EPIC french toast for breakfast on halloween morning! I used charcoal powder for the first time too. (Apparently this was a day of firsts for me. No judgement). If the idea of using charcoal powder weirds you out, just stick with me for a second. There are actually a TON of benefits to using charcoal in food! Intestinal relief, high cholesterol reduction, kidney health, glowing skin, a digestive system detox, whitens teeth, and it can even prevent hangovers. Guys. This is like magic. 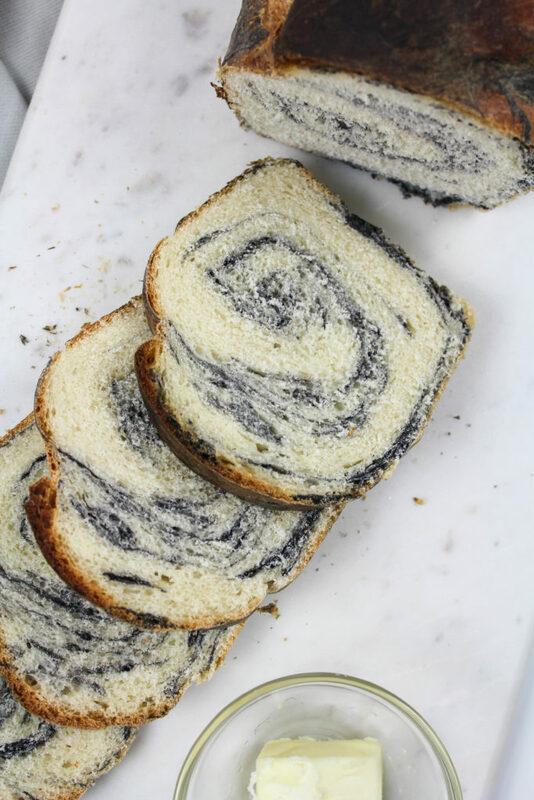 It also happens to turn foods the most gorgeous black color, without any taste at all. Halloween perfection! 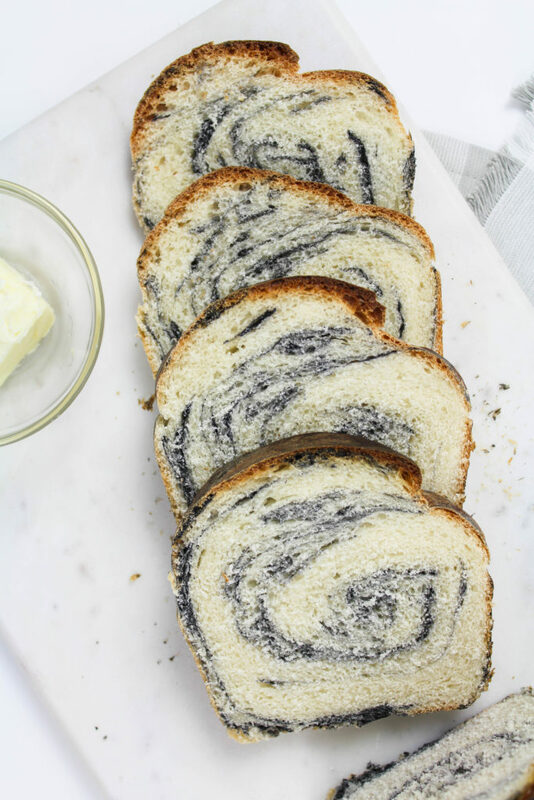 It was a must to try in this loaf. Have I convinced you to try it yet? Ok, let’s do this! Add 1/4 cup of warm warm to a bowl or large measuring cup. Dissolve the yeast in the warm water with 1 tsp. sugar. Stir well until yeast is dissolved. Let the yeast mixture stand until it begins to bubble and foam. (About 5-10 minutes). Once the yeast has become bubbly, add the yeast mixture, sugar, salt, oil, and 4 cups of flour into a large stand mixer bowl. Mix until smooth. Add the remaining flour, 1/2 cup at a time, until the dough that forms is soft and smooth. It shouldn’t be super sticky, but will stick slightly to your finger when touched. Knead the dough for 5-7 minutes, until smooth, then separate the dough into two pieces. 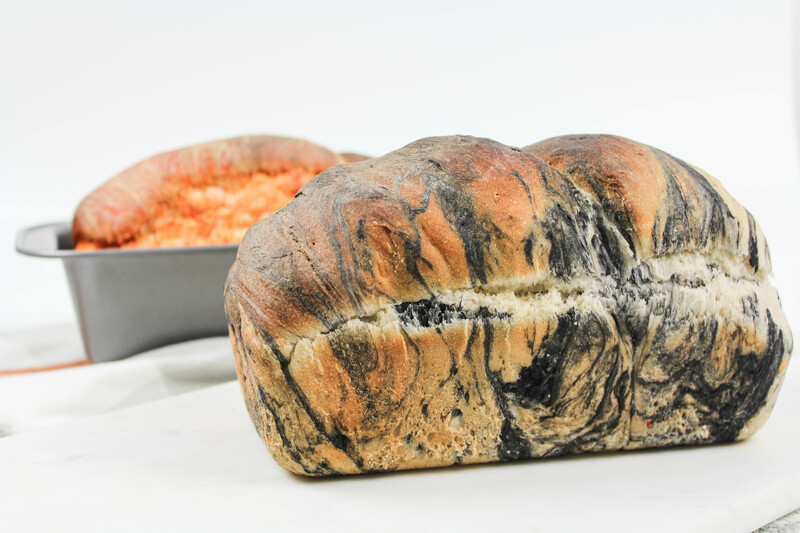 Add the charcoal powder to one half of the dough mixture, kneading the powder into the dough, until just combined. 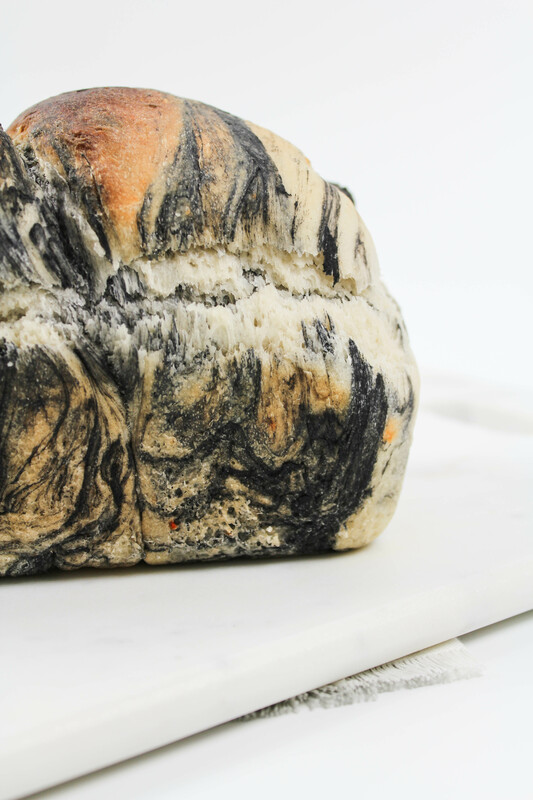 You want it to have a marbled look and you don’t want to overwork the dough. Set aside. 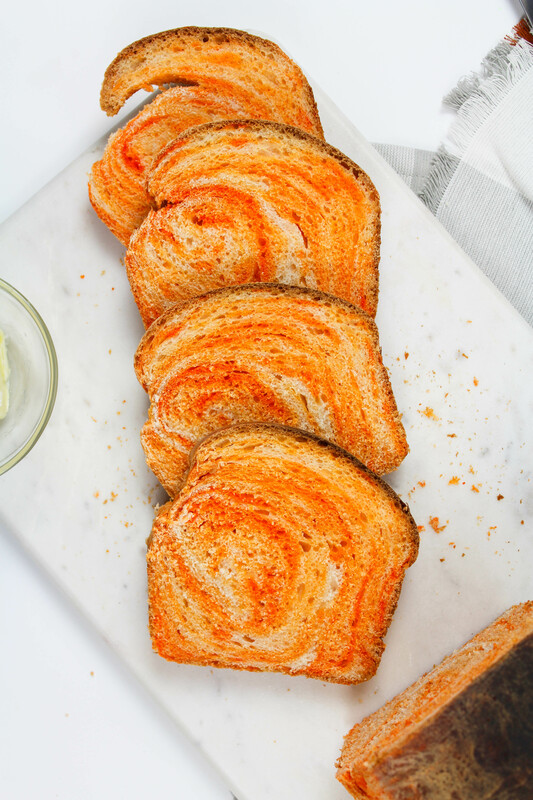 Repeat the same process with the orange food coloring and the other piece of dough. Add as much or as little food coloring as you like. Knead until just combined. Place both balls of dough, side by side, into an oiled bowl. Turn the dough over to coat the top with oil and cover with plastic wrap. Let the dough rise for one hour, or until it’s doubled in size. Once the dough has risen, punch it down gently. Roll each half of the dough into a long rectangle that is about 8 inches wide and roll the dough up, from the short edge, to form a cylinder. Place the dough, seam side down, into greased bread pans. Cover with plastic wrap again and allow the dough to rise for another hour. Preheat your oven to 375. Bake for 30 minutes, or until the tops of the loaves are golden brown. 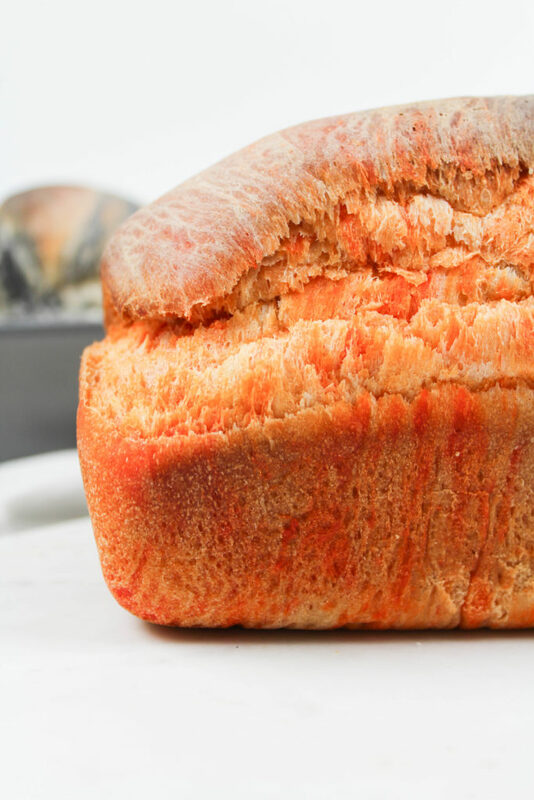 Remove the loaves from the baking pans after about 5 minutes and allow them to cool completely on a baking rack before slicing. 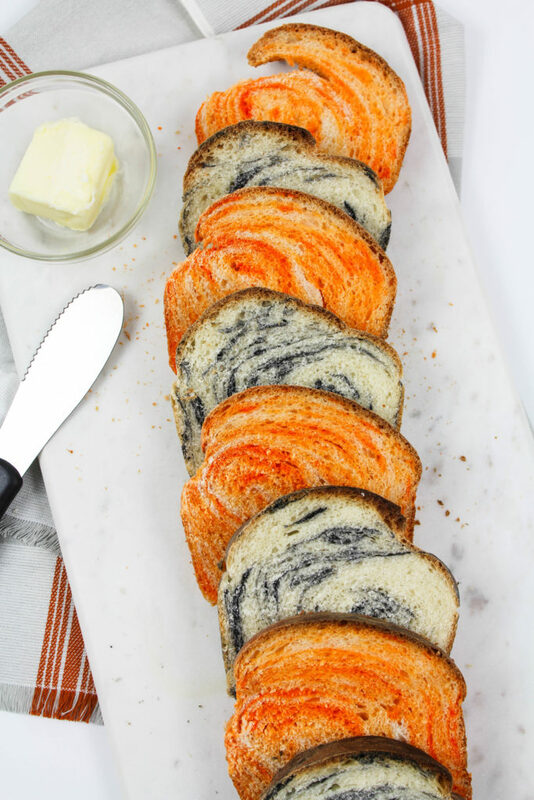 How pretty is this freaking marbled bread?! I’m low key obsessed. This will not be the first time I make marbled bread. Just sayin’. Add a fun Halloween surprise, in your kids lunch boxes, with an October themed sandwich! Steal my french toast idea, please. 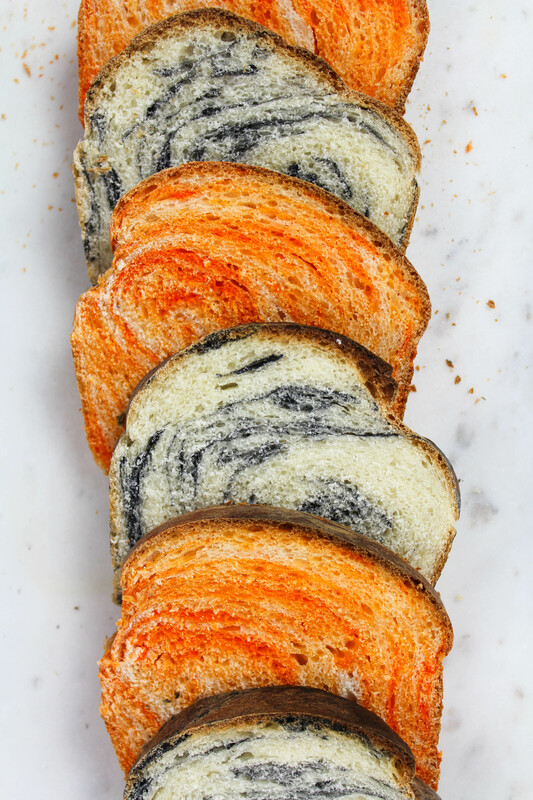 How are you going to use your marbled bread for Halloween?